Is pregnancy exposure to fluoride a cause of early childhood ADHD? According to a new study, it might be. 1. "that children with elevated prenatal exposure to fluoride were more likely to show symptoms of ADHD " . Specifically "inattentive behaviors and cognitive problems, but not with hyperactivity. The same team recently found in a previous study that higher levels of urine fluoride during pregnancy are associated with lower scores on tests of IQ and cognition in the school-age children. Wait- I thought Fluoride was safe and prevented cavities?! Well, its a fierce debate. Yes it does prevent cavities ... but is there a cost? For over 60 years the water in the US has had fluoride added to it in order to prevent tooth decay. 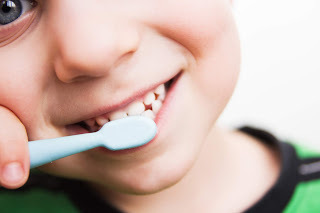 Just about every single dentist you meet will tell you that fluoride is an important ally in the fight against cavities and encourage even the youngest children to use fluoride toothpaste and use a fluoride treatment in their bi annual dental check ups. But, the reality is that for years now there has been a fierce debate over the safety of water fluoridation — Extremely high levels of fluoride are known to cause neurotoxicity in adults, and negative impacts on memory and learning have been reported in rodent studies, but little is known about the substance’s impact on children’s neurodevelopment. How Can I Decrease my Fluoride Exposure (especially if pregnant or with young children)? 1. Buy the Right Water Filter: I can't stress enough how important it is to get your water tested and find a water filtration system that best meets your needs.... not just due to fluoride in water but, this is yet another reason to invest in one! Water fluoridation represents 30% to 70% of a typical individual’s total exposure. I wrote a details guide on how to choose a water Filtration System and I specifically mention the one I purchased for my family too. 2. Switch to a fluoride free toothpaste. Especially if you are pregnant, especially with children.